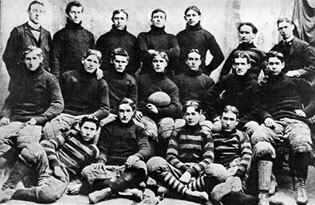 The first Boston College football team to face off against Holy Cross did so twice in November 1896. The first game, played in Worcester, on a date that is now forgotten, went to BC 6-2. The second, on November 14, played in Boston in a location that is now forgotten, ended in controversy. With four minutes left, a fight broke out between opposing players yards from the Holy Cross end zone. A foul was called on Holy Cross, and while players and officials argued, the clock ran out and Holy Cross was declared the winner 6-4. Boston College protested, and Holy Cross, which had left the field, was called back to replay the final four minutes. When the Crusaders refused to return, Boston College played the final minutes unopposed, scored a touchdown with a clear run into the end zone, and declared victory.